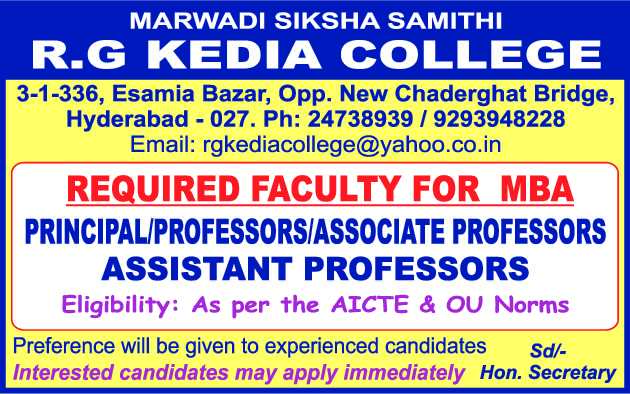 R.G.Kedia College, Hyderabad has advertised for recruitment of Teaching Faculty- Professor / Associate Professor / Assistant Professor / Principal jobs vacancies. Interested and eligible job aspirants are requested to apply immediately from 20th March 2019. Check out further more details below. About College: R.G. Kedia Degree & P.G. College was established in the year 1972 for the educational development by leading industrialists Philanthropists and educationists. This society has been functioning for the past eight decades and is located in the heart of the city Opp. Chadarght New Bridge, Esamia Bazar, Near Koti, and is easily accessible. How to Apply: Interested and eligible candidates are requested to send their application along with CV, copies of certificates, PAN card, Aadhaar card and recent passport size photo to the email address given below or at the college address.